Our highlights of the week this week included – milking some cows in the garden, hunting snails, and some very illusive ducks at the park! After eating lunch outside one day (it wasn’t quite as sunny as last week but at least it wasn’t raining!) 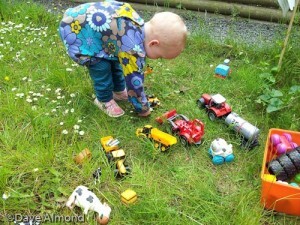 Annabelle brought her farm toys out to play with on the grass. 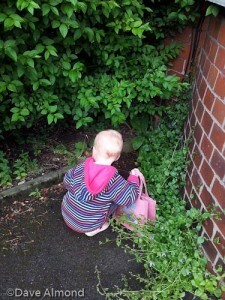 They looked great in the grass – just how a farm should be! She loved giving all the animals real grass to eat, and pushing her tractors round the bumpy lawn and over the noisy stones! She has a little milk wagon and some milk urns, and decided to milk the cows. I love the way she turns the cows upside down to find the udders, and then ‘pours’ milk from the cows into the urns! 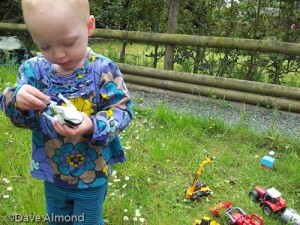 The Mummy cow also fed all of the other animals with her ‘milkies’ – she is one busy lady! 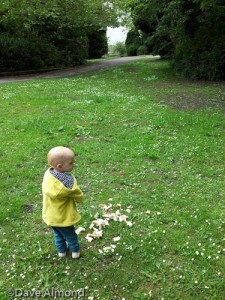 We popped out to do a few errands one morning, and I took some bread with us, hoping to find a park with some ducks! 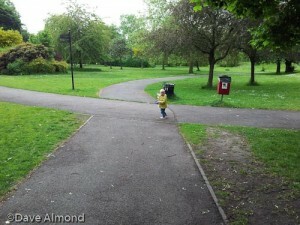 When we had finished, I realised that we were pretty near Debdale Park which we had visited once before with friends. I knew there was a reservoir there so I was hopeful that we might find some ducks. 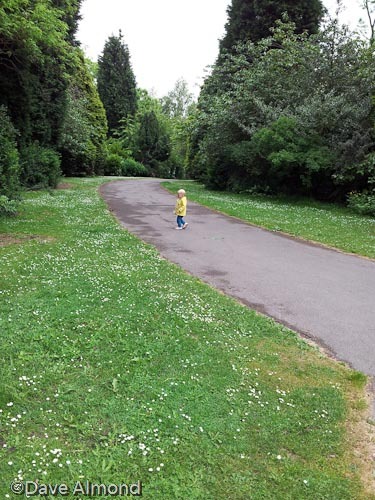 We walked through the lovely trees and gardens, a rose garden, and community orchard and found the children’s play area (but still no ducks!). 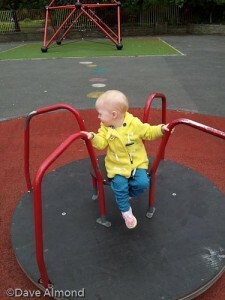 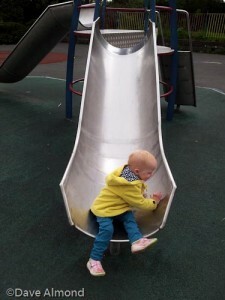 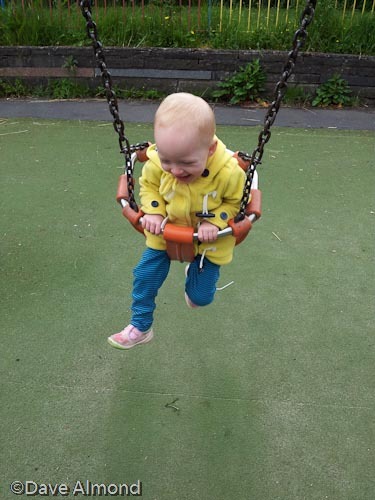 Annabelle set off to explore the swings, slide and very fast roundabout! When she was finished playing we wandered off in the direction where I had caught a glimpse of water, although it soon became clear that we weren’t going to get close to the water due to a large fence and wide bank between us and the reservoir! I persuaded Annabelle to leave her bread for the birds instead of ducks and she happily dumped the whole lot in a little pile. 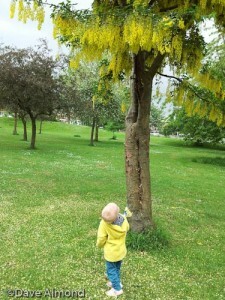 That lovely yellow tree is a laburnum (i only know the name as we have six of them at the golf club)Annabelle looked to be enjoying herself.